If you're interested in making your own jewelry, either as a hobby or selling as finished products, I must say you'll have so much fun! I love making my own jewelry, because I know there's no other piece exactly like it. Yes, I may use similar techniques, but my creation is just that - mine. Handmade jewelry is great for gift giving, selling and building up your own jewelry collection on a budget. You can find affordable supplies and tools online and at craft stores, so get to creating today! This hammered wire ring is one of my favorite pieces to make, because I LOVE the hammered look. It's rustic but elegant, and depending on the thickness of your wire, you can make some pretty and delicate pieces that go with just about any outfit. Also, I've made these for my son and boyfriend in silver aluminum, and they love 'em. To measure your finger, use a strip of paper (or real ring sizer, lol) wrapped around your finger. I want mine to overlap about an inch or so, so I mark it on the paper. Cut the wire to size with flush cutters. When cutting wire with flush cutters, face the flat side of the cutters to the side of the wire that will be your ring. This way, you get a clean edge on the piece you're working on and you won't have to do so much filing. Also, you can just clip off the ends with the flat side. File down the edges of the wire so you don't have any sharp edges that will poke your finger. Using the ball side of the hammer, gently hammer down one side of your piece on the bench block. To reduce the chance of the bench block bouncing around your workspace, place a towel underneath. Start in the middle and work your way out to one end. Flip the piece around, start in the middle and work your way out again towards the other end. When you hammer the ends, they will round out and flatten - work gently to avoid a too-flat end. Take this time to check the edges for sharpness and file them down. Starting from the middle of your hammered wire, begin to gently wrap each end around the ring mandrel. I start off 2 sizes smaller than I want the ring to be, because as you hammer metal, it will stretch out. I want a size 5 ring, so I wrap my piece at size 3. Now that you have formed the ring around the mandrel, gently strike all around the ring with the ball end of the hammer. This will form the ring into a circle and flatten down the edges. Pull the ring off the mandrel and squeeze the ring gently so that the ends are sitting snug against the rest of the ring. Hammer again until you're satisfied and it has landed on your ring size. The bottom of the ring should be on the size you want it to be. Test to fit and check for sharp edges one more time. Gently file down as necessary, by pulling the edge slightly away from the rest of the ring so that you don't scratch it. Polish your finished piece with a polishing cloth or pad. Depending on my mood, I can wear it as a single ring or a faux double wrap ring. 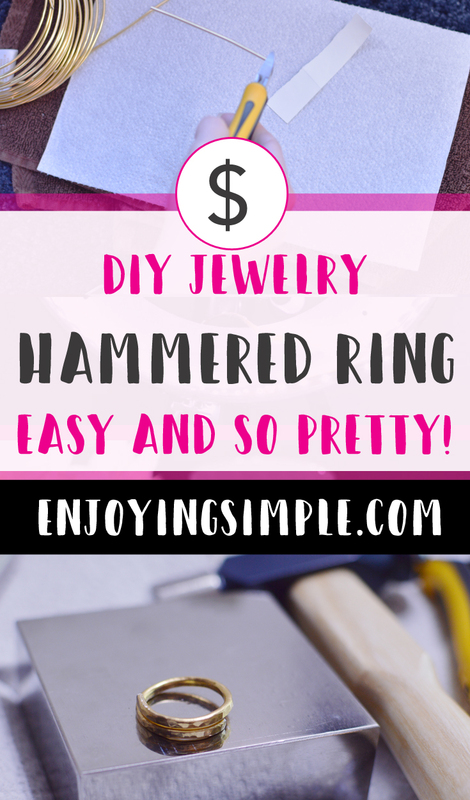 So there you have my super easy tutorial for your very own DIY Hammered Wire Ring. You can use any type of metals to create this ring - silver, brass, aluminum (what I use), gold, etc. Please Pin this Post. Every share helps so much.